The raging controversies over the compatibility of the Christian Faith and modern science that have divided public opinion have swirled around the introduction of theological ideas and interpretation into science textbooks in public schools, creating a confusion of categories and methodology that threatens to handicap both science education and authentic theological instruction. 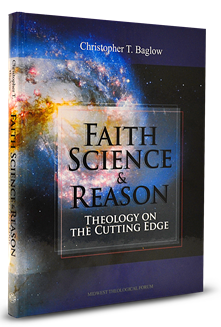 In this pioneering textbook, theologian and author Christopher Baglow takes a different approach – the inclusion of science in a theology textbook for the purpose of rediscovering faith on the frontiers of science. The result is a stunning reconsideration of the relationship that delivers new insights into the Christian Faith while preserving the integrity, and the astounding heritage, of modern science. The Big Bang about Creation: Is Sacred Scripture Anti-Science? The Biggest Question: Has Science Disproved God? Beautifully illustrated and thoroughly faithful to the Christian Faith and the teaching of the Catholic Church, this book is a must-read for anyone struggling to understand the credibility of the Christian Faith in the light of modern science and the possibility of a friendly reunion of faith and science in contemporary society. "This book is a marvel of comprehensiveness, concision and insight – stunningly well done: everywhere surprising resolutions of old cruxes and remarkable synthetic power. Baglow’s achievement is a model for what theologians should be aspiring towards." "Baglow takes authentic and unadulterated Catholic teaching and authentic and unadulterated science and shows them to be in wonderful harmony. He shows that the record of the Catholic Church in relation to science is one to be proud of, and indeed quite glorious." "This book is an excellent discussion of the Catholic perspective on the relationship between science and religion; this discussion should be part of the curriculum of every Catholic school."